I wonder if its the snowboard influence. People take a 30 minutes lesson and they are able to "board". How many boarders do we watch that really use the edges. There are some that really can, but the vast majority (especially at local hills) are just sliding and skidding their way down the hill, and enjoying. I think wide skis emulate some of that, and the width makes them easier to slide around without those nasty edges getting in the way. Similarly, snowboards really float in powder -- so do the wide boards. The other option is that it is slick marketing by the ski companies creating a market that really isn't there. Bottom line question?? 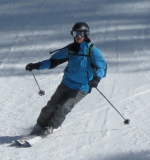 Are more of the "average" skiers excited about and having a good time skiing because of wide boards, even if it is only because they provide the illusion of big mountain skiing?? I think the answer is yes, and if they are enjoying it then its hard to fault them for the way they've found to enjoy outdoor physical activity. My east coast ski is my Head SuperShape Magnums. 72 under the waist with pretty decent versatility.